The art form of film is different from painting. Painting is one particular moment in time, frozen. Film is fluid, seeming to move through space and time. 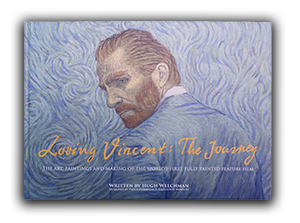 So first we had a Painting Design team spend one-year re-imagining Vincent’s painting into the medium of film. These paintings, along with the storyboard and Computer Generated Layout Animatic formed the basis on which to plan our live action shoot. The live action material was then combined with Computer Animation for elements such as birds, horses, clouds and blowing leaves and composited together with the Design Paintings to create the Reference Material for the Painting Animation. The painting animators used the reference material as the basis for the layout of their first frame, and the movement of the shot. The painting animators task was to transform this reference material into Vincent van Gogh's painting style, and then to re-create the movement of the shot through animating each brushstroke. Once a frame is complete the painting animator takes a 6k resolution digital still, and then starts work on the next frame. There are over 65,000 frames in the film. At the end of each shot we are left with a painting of the last frame of the shot. There are 898 shots in the film.